London Fields Primary School is the place to go for Hackney’s newest farmers’ market, which opens at 10am on Sunday 16 May. Caroline Brittain of London Fields Primary School said, “We are delighted to host the London Fields Farmers market. We see this as a valuable opportunity for our children to develop a greater knowledge and understanding of how ethical, good food is produced, to support local small businesses, and open up our facilities to the community. Cheryl Cohen from London Farmers’ Markets said, “We’re delighted to be welcomed to Hackney, and to be supported by London Fields Primary School in this venture. “Many of the farms at the market are new to us, such as Church Farm and FW Pepper, both from Hertfordshire, and Akiki Organics from Worcestershire. Church Farm is a small mixed farm with an amazing range of products. Akiki are biodynamic and very enthusiastic about their vegetables, salads and preserves! “There will be a range of produce from plants, freshly pressed juice, asparagus & early strawberries if we’re lucky. “Delicious organic & outdoor reared meat, game in season, dairy, plants & flowers, hand made preserves, soft fruit & top fruit, herbs, wet fish and shellfish, free range eggs, and the freshest vegetables and salads. Something for everyone, with a range of prices. “The farmers’ market will only have stall holders who farm within 100 miles of London and everyone is visited before they sell with us. Secondary producers such as jam makers have to use a minimum of 50 per cent local ingredients and we ask bakers to use seasonal ingredients and free range/organic eggs. All LFM markets are certified by FARMA. 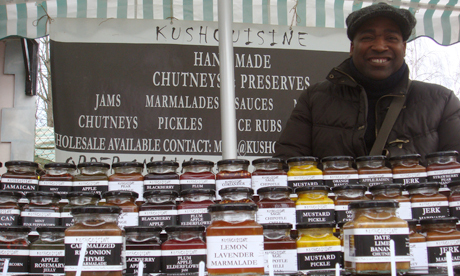 London Fields Farmers’ Market every Sunday 10am – 2pm from 16 May at London Fields Primary School, Westgate Street E8 3RL, by Broadway Market and London Fields.